Revel in the spectacular cityscape panorama from your exceptional vantage point. Embracing local culture, your room's door is decorated with a magnolia, the city's emblem. 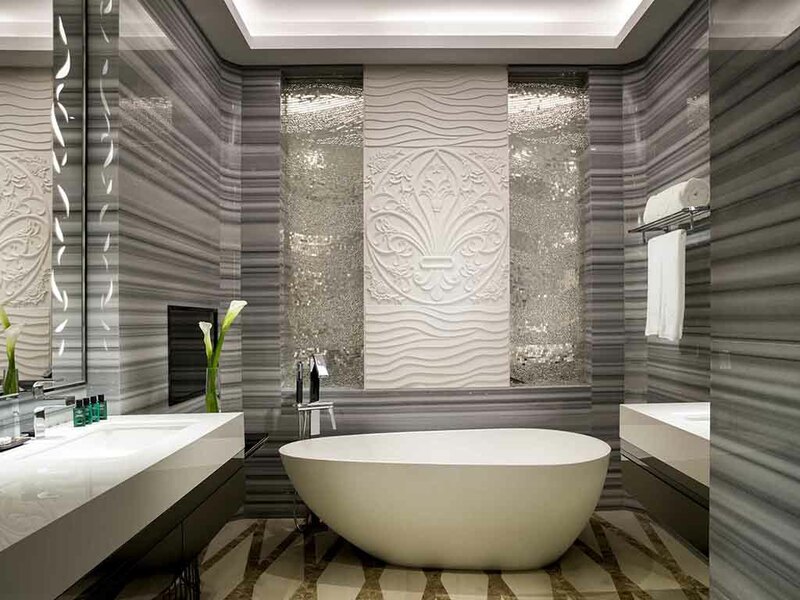 Exquisitely-curved lighting and a rock-like backdrop create a unique space for contemplation. Each Sofitel is a unique blend of the French art de vivre and local refinement. 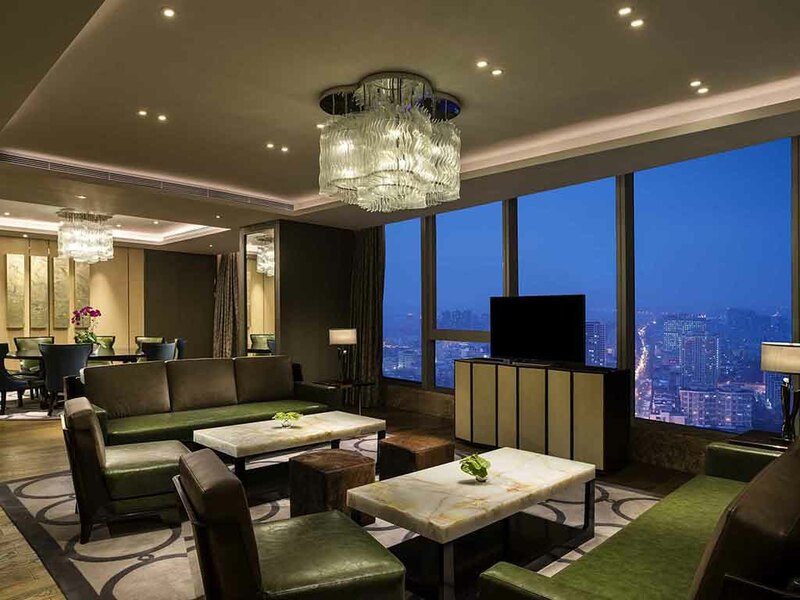 The lofty Sofitel Lianyungang Suning is a cocoon of sophisticated savoir-faire combined with Chinese folklore, enticing you to the delights of this mountain-side harbor city. The exquisite, intricate design motifs adorning the hotel invite you to discover the arts and natural wonders all around. The decor's textures and shapes evoke the spirit of local soft sand, curling waves, rocky mountains and ancient literature. Experience the vibrancy of this historic port in the city's first international luxury hotel. Explore the strategic point where Europe meets Asia at the southern terminus of the new Eurasian Land Bridge rail link. In the only hotel with French sophistication and flair in Lianyungang, you can immerse yourself in authentically elegant surroundings. Delight in an unparalleled sensory world where local artistic culture blends with refinement par excellence. 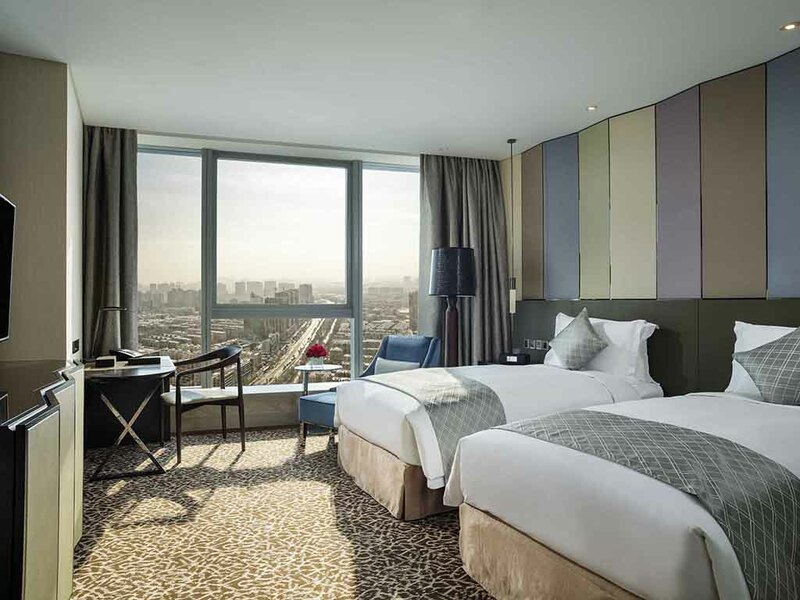 Sofitel Lianyungang Suning is only 3 km from the train station, 30 km from Lianyungang Baitabu Airport, 360 km from Nanjing Lukou International Airport and 510 km from Shanghai Pudong International Airport. From Lianyungang Baitabu Airport, get onto Airport Road, turn right after 1.2 km into the 323 Provincial Highway, turn left after 22.8 km to West Hailian Road. 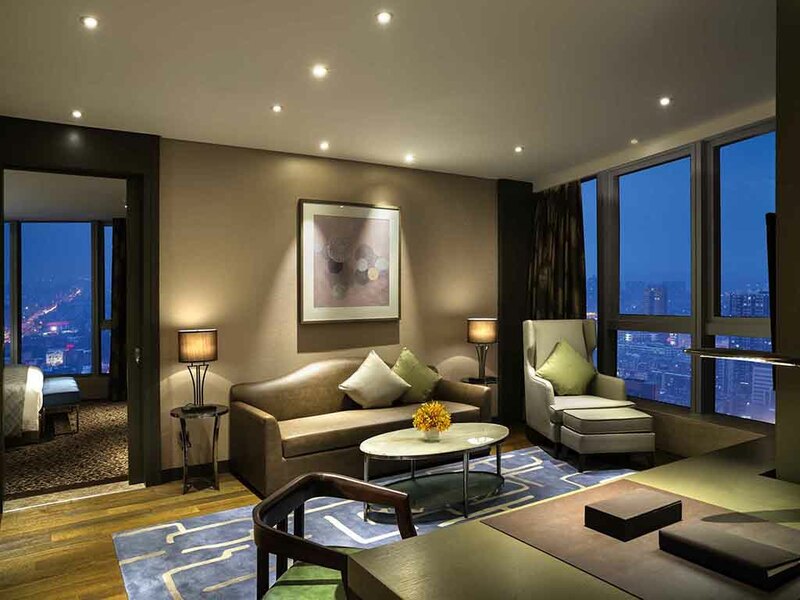 Drive to the junction of Middle Hailian Road and Tongguan Road and turn left to reach Sofitel Lianyungang Suning. 38 m², located from level 27 to 33, modern French décor, Sofitel MyBed, Lanvin amenities, separate bathroom with rain shower and bath tub, LCD TV with satellite channels, Complimentary WiFi. 38 m², located from level 34 to 37, modern French décor, Sofitel MyBed, Lanvin amenities, separate bathroom with rain shower and bath tub, LCD TV with satellite channels, Complimentary WiFi. 38 m², located from level 38 to 41, Sofitel MyBed, Lanvin amenities, separate bathroom with rain shower and bath tub, LCD TV with satellite channels, Complimentary WiFi. 100 m², the Suite features Sofitel MyBed, large bedroom with living room, Lanvin amenities, bathroom with rain shower and great city views, LCD satellite TV, Complimentary WIFI. 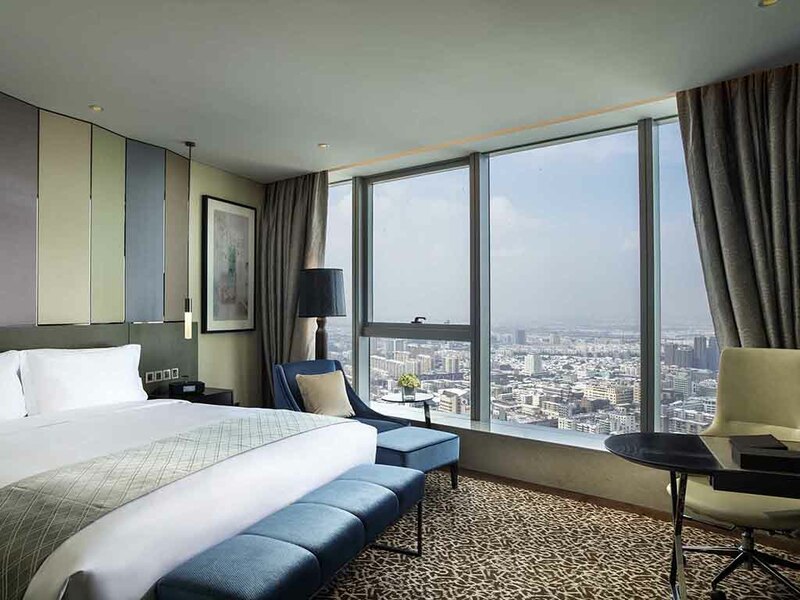 85 m², located from level 30 to 37, suite features Sofitel MyBed, large bedroom with living room, bathroom with rain shower and great city views, LCD satellite TV, Complimentary WiFi. Hotel provides in-room dining service, turn-down service, laundry service and shoe polishing service. Take a culinary adventure from Sichuan to Canton in the harmoniously decorated Le Chinois. Enjoy an informal rendez-vous or stylish aperitif in the relaxed yet chic ambience of Le Bar. The exotic harbor city setting, nestled between mountains and sea, is perfect for romantic moments to create special memories. Explore the Huaguo peak, wreathed in mist, or savor French champagne in the intimacy of your honeymoon suite. Explore this energetic harbor city, touch the fountainhead of Journey to the West, one of four Chinese ancient classics, and listen to the whisper of curling waves onto the soft sand... Lianyungang's unique charm is undeniable. Arrive as you mean to continue in the ultimate style of a limousine, sweeping you from door to door without any stress. Sit back and soak up the sights as you travel in comfort to the historic port city's most exquisite hotel. Nurture yourself in the serene 27-meter pool with relaxing laps to soothe and stretch your body. Spectacularly located on the eighth floor, this peaceful and welcoming cocoon will embrace you with its natural light.